Back pain is a widespread, debilitating health problem. Last year, a staggering 30.8 million working days were lost in the UK due to backache and other musculoskeletal issues, according to the Office for National Statistics. Only minor illnesses, such as colds, were responsible for more periods of sick leave. One of the most frustrating aspects of back pain is that its cause isn’t always clear. Until you know exactly why you’ve developed the problem, you can’t treat it effectively. You might wonder whether your mattress or office chair is to blame. Perhaps you suspect that you’ve over-exerted yourself at the gym or are feeling the effects of the ageing process. You could spend months looking for the cause while having to put up with pain every day. What many people don’t realise is that they may well be experiencing back pain because of problems with another part of their body entirely: their feet. That’s why, when you’re suffering from a bad back and desperately want to relieve the pain, tailor-made foot orthotics (also called shoe inserts and insoles) are potentially life-changing. You’re probably surprised to hear that foot orthotics can help to banish back pain, but the fact is that foot problems often lead to issues further up the body. Why is that the case? Because when you have poor foot or ankle function, your feet can’t support your weight properly, their shock-absorbing abilities are impaired and pressure is unevenly distributed across your soles. That leads to an abnormal posture and gait, forcing other parts of your body to compensate for your feet’s failings. Your back is therefore subjected to more than its fair share of the stress associated with movement. Feet are at the bottom of what’s known in the medical world as the ‘kinetic chain’, which links the ankles, knees, hips, spine, etc. It can all too easily become a chain of pain if issues with your feet – your body’s foundations – have a knock-on effect on other areas. Back pain is particularly common among people with the following foot conditions, though any issue that negatively affects your foot and ankle function is a risk factor. The reason why prescribed foot orthotics can benefit people with back pain is that they improve foot and ankle function, correcting abnormalities and imbalances. What’s more, they enhance your feet’s proprioception (essentially, their spatial awareness), making you more stable. With tailor-made orthotics in your shoes, your feet and ankles are properly aligned. That takes the strain off your back, helping it to heal. While orthotics are particularly popular among athletic individuals who frequently put their bodies under great strain, they can also help people from many different walks of life. Our London podiatrists can perform a detailed biomechanical assessment, including state-of-the-art, computerised gait analysis. We’ll identify any foot problems that could be causing backache or other issues. We can then prescribe orthotics, designed using imprints of your feet, to help stop the pain. Our lightweight, high-performance, custom-made orthotics reflect your feet and your specific issues in a way that over-the-counter options never could. They can be inserted into a wide range of shoes, and nobody can see you’re wearing them. By visiting our podiatrists and taking back care seriously, you can leave backache behind. 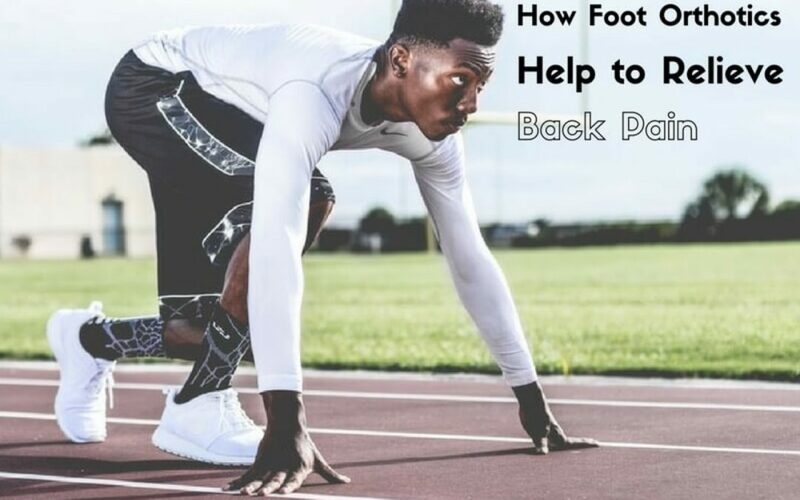 For custom-made foot orthotics to help relieve back pain, please call Feet By Pody today on 0207 099 6657 or book an appointment online.